This house, designed by Nathan Good, Architect, is participating in “net metering.” It generates enough power to run the house and actually sells the excess energy back to the power company. The eco roof was a first of its kind in the Cannon Beach area. The vegetative roof helps to keep the home cool, cuts down on storm water runoff, and is a nice view for the neighbors who live uphill. With a membrane system, special soil, and plants like wild strawberries, it’s one of a kind! 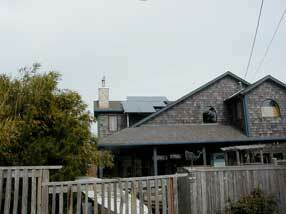 Even smaller homes on the coast can benefit from solar panels. This smaller home generates enough solar power to help offset the cost of the home office. A sunnyboy converter helps the user to track the amount of power being generated. 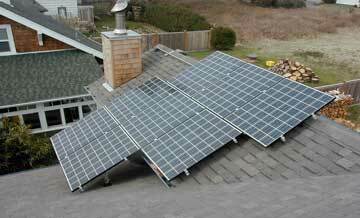 With the use of a “solar pathfinder,” we can get the best possible exposure for placement of solar panels. 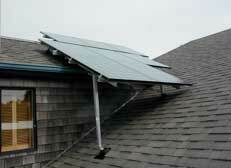 This 1.3 kW system was installed on a residence in Gearhart. The owner wanted to mount this bank of panels on the upper roof section only to leave room for another future string of panels on the lower section. Whether a house is big or small, whether the roof is steeply sloped or gently curved, a solar solution can be a great source of green energy and reduced costs. The panels had to be mounted far enough away from the chimney to prevent shading. This system required an elaborate racking system to maximize the solar potential for this small roof section.